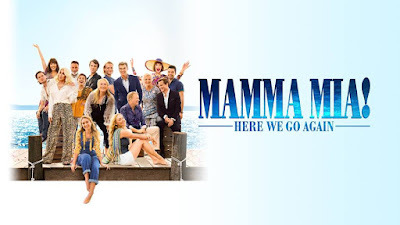 Home » Expired Contests » Enter to Win Mamma Mia! Here We Go Again on Bluray! Enter to Win Mamma Mia! Here We Go Again on Bluray! MAMMA MIA! Here We Go Again, a Littlestar/Playtone production, is produced by Judy Craymer and Gary Goetzman, producers of the original film.Craymer is also the creator and producer of the worldwide smash hit stage musical.Ol Parker, writer ofThe Best Exotic Marigold Hotel,writes and directs the sequel from a story by Catherine Johnson,Richard Curtis and Ol Parker.Benny Andersson and Björn Ulvaeus return to provide music and lyrics and serve as executive producers.The original cast members multi-award winner Meryl Streep (Florence Foster Jenkins, Into The Woods),Pierce Brosnan(The World is Not Enough), Oscar® winner Colin Firth (The King’s Speech), StellanSkarsgård(Good Will Hunting), Julie Walters (Harry Potter and the Deathly Hallows), Dominic Cooper (Avengers: Infinity Wars), Amanda Seyfried (Les Miserables)and Christine Baranski (The Good Wife)return alongsidenew additions Lily James (Cinderella, Baby Driver),Oscar® winner Cher (Moonstruck, Burlesque)and Andy Garcia(Ocean’s Eleven, The Godfather: Part III). 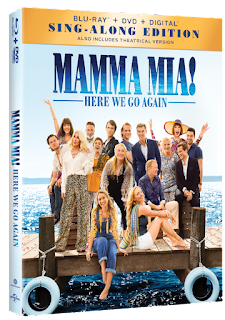 Mamma Mia: here We Go Again is available on digital October 9th and 4K Ultra HD, Blu-ray and DVD October 23rd, 2018!